Officials said there are no reports of injuries at this time. 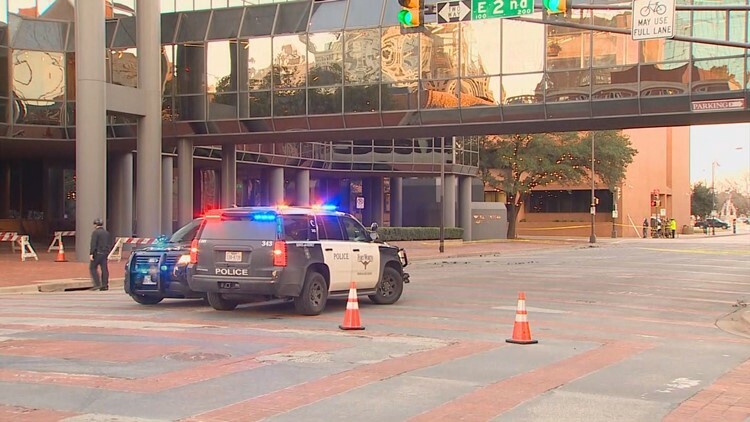 FORT WORTH, Texas — Police have blocked off several streets in downtown Fort Worth after pieces of broken glass came crashing down Tuesday morning. According to Fort Worth Fire public information officer, they received calls after 6 a.m. about glass falling from the Wells Fargo building at 201 Main St.
A cable came loose from a window washing rig, which broke the glass. No one was on the rig. Officials said there are no reports of injuries at this time. Fort Worth Fire Department has secured the area and closed off streets on Commerce Street between 1st and Main streets as a precaution to make sure other panes of glass do not fall. It's unknown how long the street shutdown would last.